Despite saying these words for the last year or so, this time I mean it. We’re nearly there. 5 years of planning, building, learning, dumpster diving, salvaging, making, wishing, waiting, thinking, re-thinking, improvising, budgeting, re-budgeting and hammering later… we’re about to move in. I have made a little promise with myself that I won’t regale you with twisted tales from the last 12 months of ‘nearly there’-edness. Suffice to say that we are very happy to be at this point, and that it has been the biggest learning curve of our lives. But anyway. 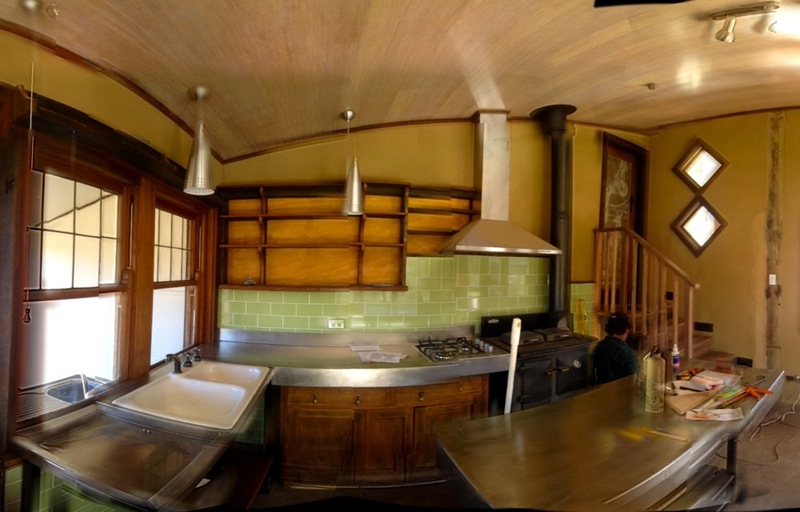 Check out our (nearly finished) kitchen! 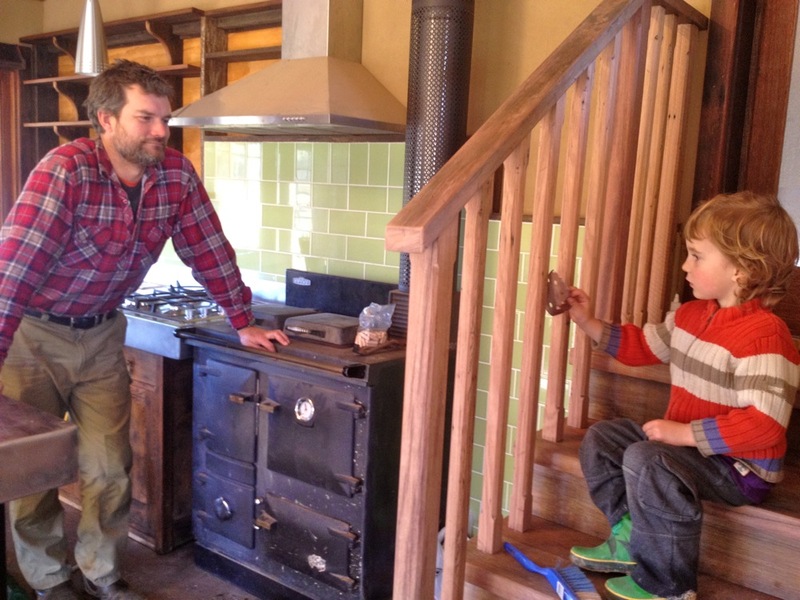 Rayburn woodstove next to emerging under-stair woodbox, which we can fill from the outside (hence little door). Can’t wait to make our first cuppa on this! The entirety of the bottom level that is kitchen + living space in a total of 25 sq meters. Click to enlarge. I feel now that we are, indeed, nearly there, I can start to discuss the tinyhouse again. For the last year it’s been a bit of a sore point as we’ve struggled to find the time, funds and expertise to finish the build (i can hear all the owner-builders out there nodding silently). But now I can start to talk about it. About the intricacies of the stand-along solar install. About the tedson coil system to allow our wood heater to talk to our solar hot water system without exploding. About the earthpump system, and our greywater strategies, and our lovable loo, and the under-stair inside-outside woodbox. And about how the winter light floods in and warms the concrete-slab floor, and about how the dam right outside reflects a shimmering mass of sunlight onto the ceiling. 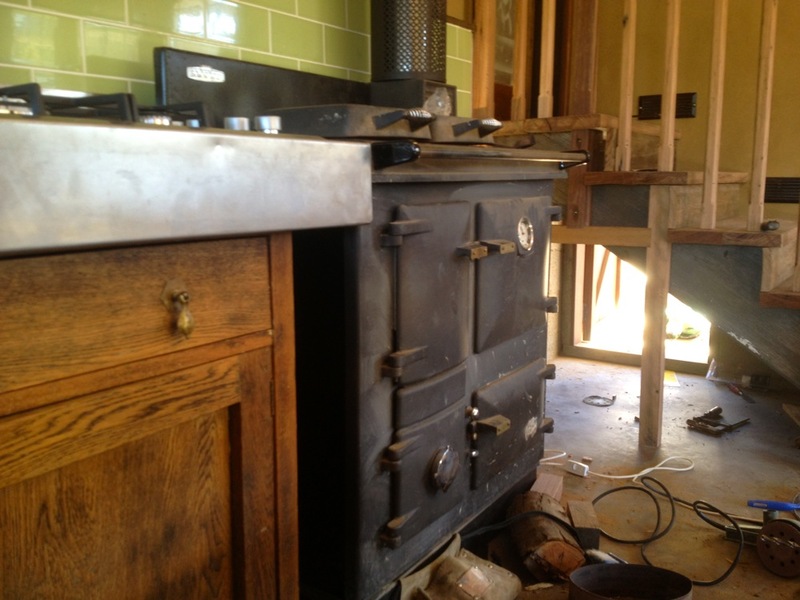 About how good it all smells in there with the linseed oil on all the beautiful recycled timbers. Hooray! Especially to Nick the extremely tenacious owner-builder, and to Shane Mills, a fencer who came to our property to help clean some paint off our salvaged shed frame 18 months ago, and has been helping build our tinyhouse since then, with a skilled and steady hand. 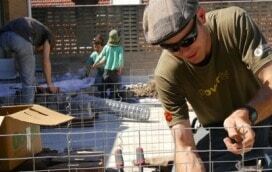 The 107 Rooftop Garden build is underway! And we've just finished . .
Last week we built a home. 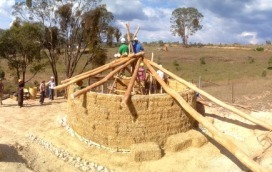 A round, load-bearing strawbale tiny h . . Very nice, very well planned out and functional. I like the woodstove and the woodpile under the stairs. 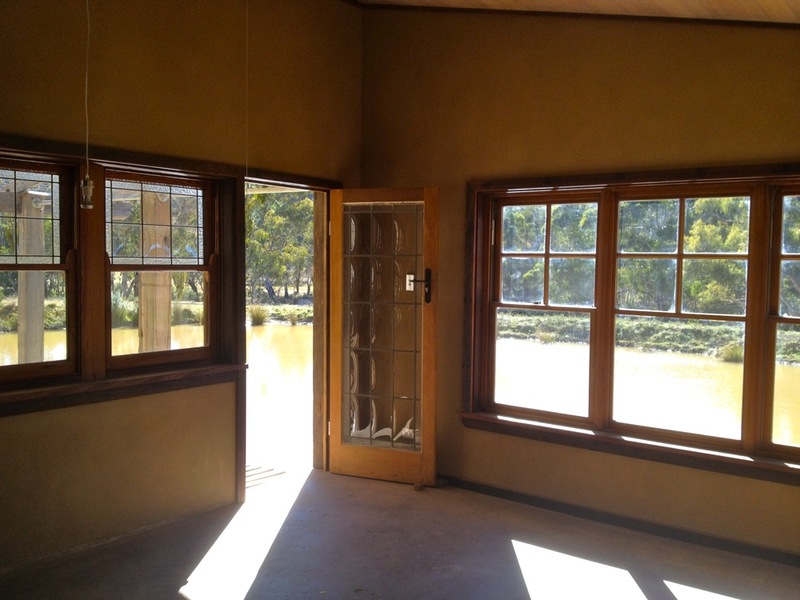 It is wonderful that you have salvaged things to build with as well as the thought to passive solar. Well done. Owner builder houses are always interesting to watch unfold. I think the tiny house has been unmasked as a timid beauty – took a while to come into her own, but still beautiful nonetheless. Personally, I would’ve been more intimidated with building the dam than the house. Yet you managed to pull both off well. I’m sure you already feel it, but you should be proud of all your efforts. Love the light and colour and the integrity of the materials that comes through. Must be lovely to stand in that room. I’m building a 35 square metre place in stone and the going is slow – following your progress has been very inspiring and the info you’ve shared about your systems and process very helpful. Enjoy the beauty you’ve created! Ahh this was just what I needed! Your new home is GORGEOUS. We’re just at the start of our project, and I’m so relieved to see that someone struggled for years before actually completing their build, but that you DID IT!! You were quite right, I was silently nodding my head. Congratulations. Your home looks really beautiful. Nothing beats wood with history in a home. 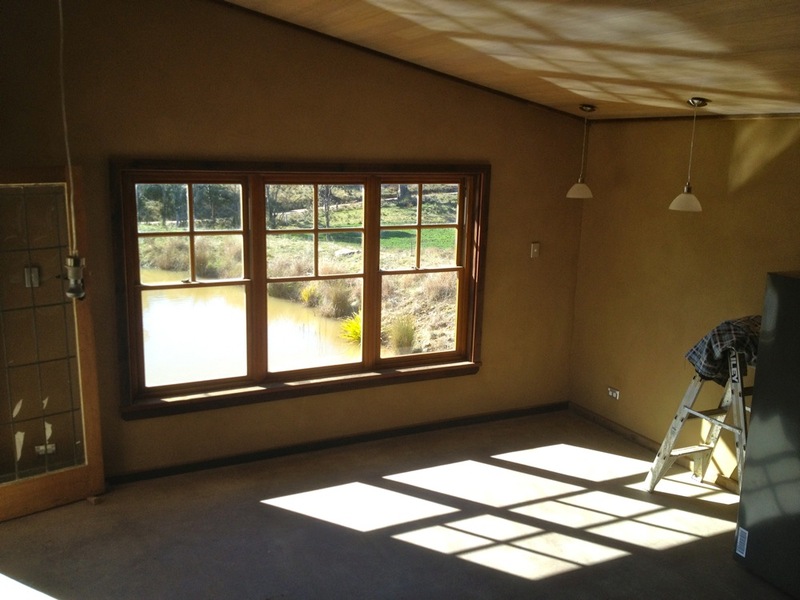 To build your own home, (and especially a slow living and thoughtful eco home), is an outstanding achievement. Well done!!! Beautiful work! Your house looks truly gorgeous, warm, earthy and with such a wonderful sense of scale – I love the salvaged windows, and the shimmering reflected light on the ceiling. Your house is a thing of DIY splendour, Nick and Kirsten. Lovin the green tiles and the inside/outside wood box. Very clever. Congrats to you both! Gorgeous, well done. So lovely to have watched your journey from the first video clip of you two in the car leaving the city. Just remember slow and right is better than fast and wrong. Yay! Well done! 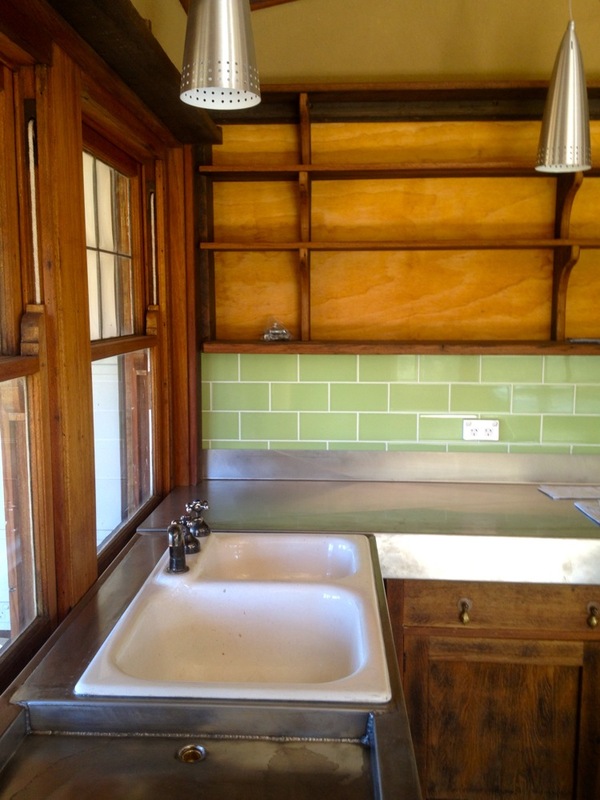 I hate to say it, but… I predict the need/desire for a splashback at the sink. Don’t know why, but it was the only thing that stuck out at me. Annoying comment aside, I have nothing but admiration for this achievement. What a gorgeous magical home. Congrats on getting this close! I’m envious of just how ‘tiny’ your home is. We’re currently designing our future home and there’s a lot of negotiation around the size. I want it small and he wants enough space for family to visit. I think we’ve finally found a solution that we are both happy with – but I’d choose a tiny tiny home anyday. I love your TinyHouse. 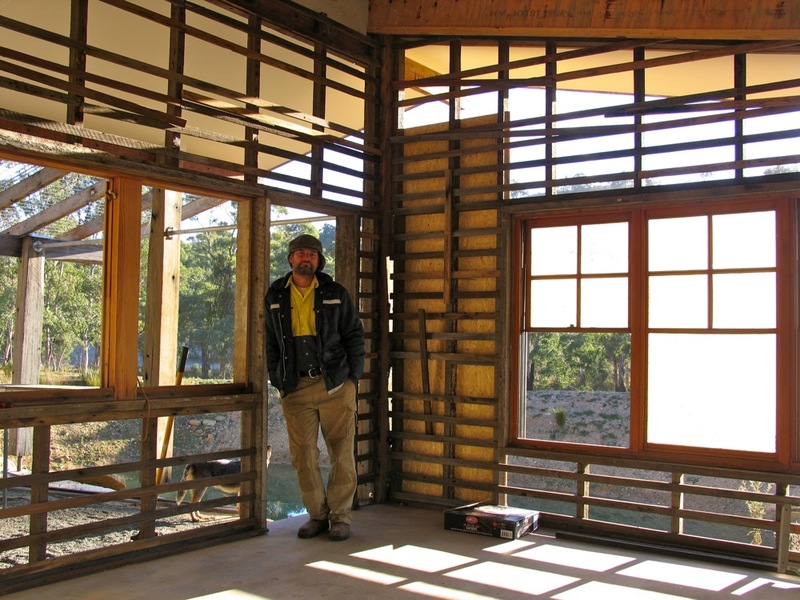 We’re starting to think about planning our own TinyRuralParadise and would love to use salvaged material, passive solar and many of the other things you have done. I’ll have to bookmark the rest of the TinyHouse story for future reading. Don’t know how you do it all you guys, and so very well. As Narf77 said, thanks so much for sharing it all with us. I built my own home 20 years ago from mud and recycled everything, it took a lot longer. Most satisfying thing you can do is create a cosy abode for family and friends that costs little to run. Gday Nick and Kirsten, Seems you finally finished and the ideas we chewed over 2 years ago worked well, especially the inside outside wood box. Well done. was glad to be of help. Its beautiful. LIght and bright. Love all the windows! Yay! We’re about to move into our tiny hand-made house very soon as well (though ours is quite a bit tinier than yours). It’s so very rewarding to be (almost) living in something built with your own 2 hands. Congratulations! Yay! Congrats guys. Like everyone else, I’m loving the indoor/outdoor woodpile door idea. Genius! WOW, it looks great, very jealous of the kitchen and the Rayburn. I cant wait to start collecting our bits for our home. Even though we have only just moved into our temporary residence the shed. So wonderful So inspirational. I wish you’d made a documentary about it. Perhaps a book? Love, love LOVE the tiny house! 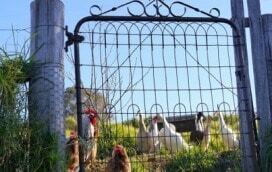 What a beautiful, peaceful place to nurture your family. You are both such a great inspiration! May your house and all the precious lives it holds be blessed. Congratulations to both you and Nick on such a beautiful work of art. I know it’s been a slog, but just think of the conversations you are going to have sitting there on a winter morning in the sunshine admiring the way the light reflects off the lovely polished timbers. YAY!